"I know, it's a lot." 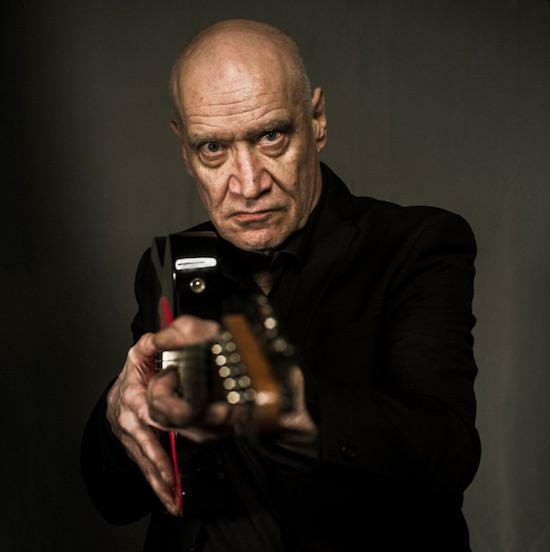 Wilko Johnson has been punctuating a day of phone interviews promoting the punchy Blow Your Mind, his first album of new material in decades, with a light summer read. "I've been reading a book about the Roman Empire," he warns tQ, "so my mind has been on weightier matters." Wilko, the ultimate rock & roll survivor, is best known as Dr Feelgood's original guitarist (or Ser Ilyn Payne from Game Of Thrones, depending on your cultural reference points – many's the time the exclamation, 'did I just see Ilyn Payne playing guitar on The Old Grey Whistle Test? has pinged around the Twittersphere) and he has, of course, had weighty matters of his own to work through over the past few years. Diagnosed with terminal pancreatic cancer shortly before Christmas 2012, being told he had ten months to live sent him spinning into a 'euphoric state' – unusual for anyone let alone a self-confessed melancholic - and a frenzy of gigging. He shunned chemotherapy, determined to rock until he dropped. His story inspired many, and it spurred director Julien Temple to make the documentary film The Ecstasy of Wilko Johnson, chronicling Wilko's journey through cancer and, he thought – everyone thought – towards the final curtain. During the October of 2013 – that fateful, 'final' tenth month – he headed with his band (bassist Norman Watt-Roy and drummer Dylan Howe, plus guests Mick Talbot and Steve Weston) into the studio with Roger Daltrey to make the album Going Back Home. They'd been talking about making a record together for several years but the diagnosis hastened things somewhat. 'Better do it quick,' as Wilko put it. No one could have imagined that the album would go gold, getting into the top 3 of the UK album charts, the most successful record of Johnson's career. Heading into borrowed time, Johnson continued to hit the road with his 'Farewell Tour', admitting wryly at the time that it risked getting "a bit embarrassing"... 'Er... I'm still here!' But it took Charlie Chan, a rock fan who happened to be a cancer specialist, to work his way backstage after a show and convince Wilko to get a second opinion. If he had what they'd diagnosed, an inoperable cancer, he would not be able to perform at all. Chan connected Johnson with the surgeon Emmanuel Huguet who considered the musician's case and discovered he had another option – an experimental operation which could kill or cure him. Wilko chose the surgery and, cut to today, he lives on, plays on - thrives, indeed – cancer-free and having celebrated birthdays he never thought he would see (and famously celebrating his 70th - and the 30-year anniversary of the Wilko Johnson Band - with a bash at the Royal Albert Hall featuring John Cooper Clarke last year), releasing a hit memoir, Don't You Leave Me Here (Little, Brown), a follow-up to Looking Back At Me (Cadiz) and writing enough new material for a brand new long-player. In terms of lyric-writing, well, the subject matter had changed a little since the last time he put pen to paper, but at the same time, he doesn't dwell mawkishly on what was, or over-play the death card. "It's tricky when you get to seventy years old, because what am I supposed to be singing? 'I love you baby, but you done me wrong?' Come on! So that's kind of a problem. But I never thought I'd be the sort of person to write songs about different sorts of real-life experiences until I got sick." He handles the drama of recent years and everything that went with it with customary gallows humour – it was, he admits, "great show-business". For Blow Your Mind, the same crack team that played on Going Back Home (minus Daltrey) was assembled. Again produced by Dave Eringa, and featuring sometime Blockheads Watt-Roy and Howe's formidable talents in full beam, the record was laid down at Rockfield Studios in Wales – the very studio where, during the recording of 1977 Dr Feelgood album Sneakin' Suspicion, the famous row blew up between Wilko and the rest of the group, ultimately leading to Johnson's shock departure – shocking for him as much as anyone else. Cue Proustian rushes aplenty. Wilko walked out into the courtyard at night during the making of Blow Your Mind and peered into the room in which this seminal, life-changing moment occurred forty years ago. "It was," he says, "like being a ghost." While there are moments on Blow Your Mind which put one in mind of the fiery early Feelgood releases, this is the first time Wilko has made a collaborative album with the current line-up, and so this fresh input also brings new flavours and colours to the fore. Naturally Blow Your Mind reflects the darker times that defined recent years, but the songs written during the period in which Wilko felt sure death was coming are, he assures us, "quite cheerful actually." As anyone who has seen the man performing live will tell you, Johnson's light is dazzling, undimmed by time and trials, and that raw trademark spiky guitar sound chugs on, harder than ever. The life force in this one is not to be underestimated. Even the Reaper had second thoughts about taking him on, so give the man your attention.